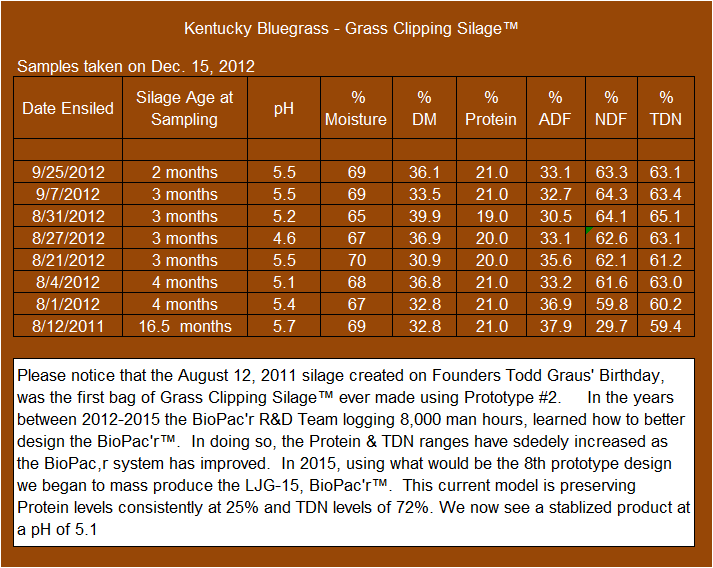 Click on any Link below to view a Grass Clipping Silage™ Feed Analysis Report from their Respective Independent Labs. We have published these feed analysis so you can see for yourself the nutritional value of Grass Clipping Silage™, a new sustainable alternative forage that is affordable to buy. It's the perfect feed for smaller herd owners because you can get a 3-year contract on this feed when we connect users to endusers via our introduction services to a local landscapers, golf courses, etc. A small two or three person mowing crew can generate between 125 and 150 tons/season. When fed as a 50-50 ration (by dry matter), Grass Clipping Silage™ plus being able to use a lower value hay or straw for roughage requirements. Producers $/lb. of gain can exceed those gains vs traditional 100 % hay rations. You will no longer have to bid against the larger feedlots for your feed. You will no longer have to pay Premium prices for Fair quality hay. Don't nave to bid against the big operations. No longer buying Fair hay for Supream prices. Locked in you cost/ton for 3-years, now you can budget. Quicker gains more milk, Happy Cows! The feed is available during dry spells, lawns nd golf courses always gets irrigated. Feed also provide moister to livestock, Up to 160 gal/ton. Dry Matter (DM): Dry matter is the moisture-free content of the sample. Because moisture dilutes the concentration of nutrients but does not have a major influence on intake, it is important to always balance and evaluate rations on a dry-matter basis. Digestible Dry Matter (DDM): Calculated from acid detergent fiber (ADF; see below); the proportion of a forage that is digestible. Crude Protein (CP): Crude protein measures the proportion of nitrogen in a feed stuff multiplied by 6.25 and this includes both true protein and non-protein nitrogen. Crude Fiber (CF): Crude fiber is a traditional measure of fiber content in feeds. Neutral detergent fiber (NDF) and acid detergent fiber (ADF) are more useful measures of feeding value, and should be used to evaluate forages and formulate rations. Neutral Detergent Fiber (NDF): Structural components of the plant, specifically cell wall. NDF is a predictor of voluntary intake because it provides bulk or fill. In general, low NDF values are desired because NDF increases as forages mature. Because NDF can be used to predict intake, it is one of the most valuable analyses to have conducted on forages for dairy rations, and can be useful for beef rations that rely on primarily forages. Low NDF usually is desired. NDF Digestibility: This is an estimate of the proportion of NDF digested by rumen microbes over a given period of time (i.e. 30 hours). Currently, laboratories may report NDF digestibility at different times, but the most common times are either 30 or 48 hours. The greater the NDF digestibility, the higher the intake of a forage and, for dairy cows, a more positive effect on production. As NDFD decreases, ligin increases. Ligin: This represents the highly indigestible portion and is associated with fiber. The greater the ligin content of a plant, expressed either on a dry-matter basis or as a percentage of the NDF, the lower the digestibility of the forage. Ligin content of a plant increases as the plant matures. Acid Detergent Fiber (ADF): The least digestible plant components, including cellulose and ligin. ADF values are inversely related to digestibility, so forages with low ADF concentrations are usually higher in energy. Total Digestible Nutrients (TDN): The sum of the digestible fiber, protein, lipid, and carbohydrate components of a feed stuff or diet. TDN is directly related to digestible energy and is often calculated based on ADF. TDN is useful for beef cow rations that are primarily forage. When moderate to high concentrations of concentrate are fed, net energy should be used to formulate diets and predict animal performance. Net Energy (NE): Mainly referred to as net energy for maintenance (NEm), net energy for gain (NEg), and net energy for lactation (NEl). The net energy system separates the energy requirements into fractional components used for tissue maintenance, tissue gain, and lactation. Accurate use of the NE system relies on careful prediction of feed intake. In general, NEg overestimates the energy value of concentrates relative to roughages. Net energy is the energy available to an animal in a feed after removing the energy lost as feces, urine, gas and heat produced during digestion and metabolism. NE is the most useful energy estimate for formulating rations. The net energy value of a feed depends on whether the feed is used for maintenance (NEm), producing weight gain (NEg), or milk production. Relative Feed Value (RFV): A prediction of feeding value that combines estimated intake (NDF) and estimated digestibility (ADF) into a single index. RFV is used to evaluate legume hay. RFV is often used as a benchmark of quality when buying or selling alfalfa hay. RFV of feedstuffs other than alfalfa is not relevant. RFV is not used for ration formulation. Relative Forage Quality (RFQ): Like RFV, RFQ combines predicted intake (NDF) and digestibility (ADF). However, RFQ differs from RFV because it is based on estimates of forage intake and digestibility determined by incubating the feed stuff with rumen microorganisms in a simulated digestion. Therefore, it is a more accurate predictor of forage value than RFV.